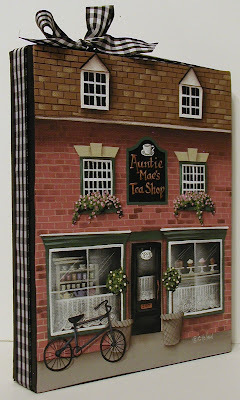 The aroma of fresh brewed tea and cakes guides customers through the door at Auntie Mae's Tea Shop which has been in business for over 30 years. Mae rises at 5am every morning to start baking her delicious cakes, cupcakes, and desserts to serve along with her lunch and dinner menu. Desserts are displayed on the counter before the first customer steps through the door and the bell jingles. Her niece Lydia works with her serving customers and cooking along side her auntie. Their customers often comment they come not only for the wonderful food and tea, but because they love these two sweet hard working women! So nice. I love the close up view. I feel like I'm peeking right in. When I was young, Mae's was the dress shop in town. There was Lee's Barber Shop, The Garland Cafe, Burn's Market, The Main Theater and Evan's Drug Store where we would sit at the soda fountain sipping a Root Beer Sour or a Malt. What a beautiful little painting!! I can only say "Wow!". I have always had a weakness for shop windows (old or new) and this one is just adorable. Please continue to paint some from time to time, it's a real delight. 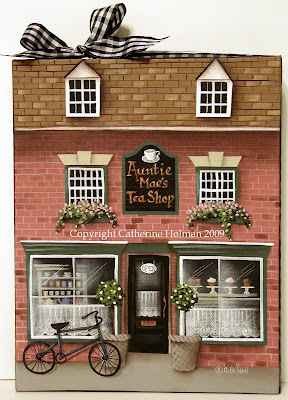 I was just visiting Becky at Sweet Cottage Dreams...she's over the moon about her Catherine Holman piece! This is very nice and I hope that tea shop owners all over will take you up on some custom orders. If Summer Pudding existed somewhere other than my mind, I would have you paint that for me. Your painting is delightful!! I love the peek inside the windows. This one is fabulous Catherine...right up my alley..I love my tea every day. A little too much actually, I wish I could cut down but it is my one vice I allow myself so...what the heck. This one is a treasure. Cathi, I love that painting!! I'm a tea drinker and it is calling me, please let me know when it comes out in a print! This is so darling! I love the ribbon around it. Hmmm Catherine, I think I may have to bid on this one...this is one of my all time favorites that you've done and I feel like I have to have it. :) I just keep coming back to look at it. I'm one of the ones who suggested you do a tea room painting, but I missed the auction :-( Please let me know when the prints are available! Can we order in advance? P.S. - Here's a hint for another painting - a cute house with a rose arbor! I would love one of those!